Dr. David Jernigan, Biologix Center: If You Have Even One of These in Your Mouth You Are in Danger! If You Have Even One of These in Your Mouth You Are in Danger! A major victory for the health of hundreds of millions of people is truly happening! After poisoning the world population, and creating much of the autoimmune, neuro-degenerative, and autonomic illnesses, the use and promotion of mercury-based dental amalgams is being eliminated from dental practice by governments worldwide! Why is this happening? Is there a shortage of mercury causing it to be outlawed? NO! It is finally being acknowledged as extremely bad for you to have even one of these old silver amalgam fillings in your mouth. 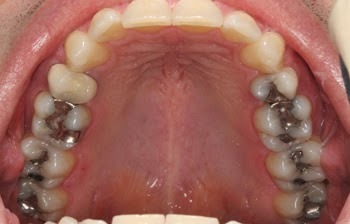 If you have any silver amalgam fillings in your teeth you need to seriously consider getting it removed. These amalgams are toxic and have been linked to over a hundred different illnesses. I compare this issue to the cigarette industry coverup; they knew that their cigarettes were creating health problems and hid the research. I think the ADA should be handled in the exact same manner as the cigarette industry...taken to court, and made to pay billions for the damage they knowingly inflicted upon society by ignoring and suppressing all the research that has overwhelmingly demonstrated the many problems caused by using mercury amalgams. The ADA went as far as threatening dentist's licenses for removing mercury fillings for any reason other than for cosmetic reasons. Biological dentists and other more naturally-inclined dentists could not remove them for health and disease treatment or for disease prevention. Read the following links for more coverage on this important issue: http://bit.ly/1v9YVZt and http://bit.ly/1CPRGXw. If you are thinking about getting your old silver (mercury) amalgams removed and replaced with composite fillings, please be aware that there are things you need to do before, during, and after removal to insure that your body is correctly supported. You might think you are sick now, and getting the amalgam fillings and other metal retainers out will help you heal, but if done incorrectly you could go from the proverbial frying pan right into the fire! Mercury from amalgams and other environmental, vaccine, and dietary sources is much more toxic than lead or even arsenic! (Sam, Ziff & Michael F. Ziff, D.D.S. Dentistry Without Mercury. Orlando: Bio-Probe, Inc. 2001. Pg. 11.) So even with the most careful removal of the dental metals from your teeth, it could stir up metals all over your body to relocate to new areas and cause even more damage. Remember, we call these metals toxins because they damage tissue. These are not just irritants that once removed will cause the body to instantly start working correctly. The tissues that have been damaged by the heavy metals will need support in order for the body to be able to repair the damaged tissues and restore optimum function. Over the last twenty years I have trained and worked side by side with renowned biological dentists to develop pre- and post- amalgam removal support protocols. * There are many considerations that must be taken into account to enable the liberation of the heavy metals that are inadvertently released by the amalgam removal, as well as the heavy metals that have lodged in various tissues in the body. The following is a good pre- and post- amalgam removal protocol. * For your convenience the six primary products in the protocol are being put on our website at a reduced package price. These products should last at least one month depending on the amounts you are taking of each product. It is recommended that you begin the process of building up your organs of elimination (liver, kidneys, lungs, and skin) by beginning this protocol at least 4 weeks prior to amalgam removal and continue the protocol for three months after the last of the amalgams have been removed. Your biological dentist may want to remove the biggest and worst amalgams first and then the others on subsequent visits. Even if your dentist takes precautions to keep more metals from entering your system, you will need to still detoxify, using this or some other protocol. The dislodging and stirring up of the metals that have leached out of the fillings over the years are now released from where they have been electromagnetically held in the tissues. Binding Cellular Impurities - Binding Cellular Impurities has the same vital ingredients as the BC-I, including Vitamin K-2, Resveratrol, and the purest available Omega 3 oils, EDTA and more. This formula provides the finest multi-vitamin/mineral available. Essential Daily Defense - No other garlic-based product comes close to the powerful, synergistic combination of this unique formula. Omega-3 Softgel - The American Heart Association reports that Omega-3 fatty acids reduce heart disease, high blood pressure, stroke, and sudden death! Omega-3 may also promote healthy cholesterol and triglyceride levels, normal heart rhythm, healthy brain and memory function, easy joint movement. Ginkgo Biloba - Ginkgo is believed to have a regulating effect on the entire vascular system of veins, arteries and capillaries. Ginkgo promotes blood flow in the brain by working with the body to improve the use of oxygen and glucose, enhancing mental performance. Primrose Oil is especially popular with women and active people seeking nutritional support for their personal health requirements. These essential fatty acids are necessary components of all body cells, but not found in commonly consumed foods. 2. Homeopathic Dental Materials® (1 fl. oz.) - This homeopathic remedy helps with dental material sensitivity that may flare during the extraction process and assists the body in eliminating toxicity and reactions to the anesthetics and new dental materials that the dentist may use to replace the old amalgam fillings. This is a homeopathic cord of the energetic principle of mercury and other dental materials (cord = multiple potencies of the same substance in the same bottle). It may sound like you are putting mercury and other potentially toxic substances in your body, but it is just the homeopathic signature of mercury and materials that will cause the body to push those substances out of the tissues, so that the chelating agents in the BCI can grab onto them and whisk them out of the body. Research has documented that if an animal were injected with a sublethal dose of a heavy metal that the body would naturally eliminate about 30% of the metal via the urine and feces. If the animal is given the homeopathic cord of that metal, the body will immediately eliminate another 39% of the metal from the tissues. This homeopathic remedy contains the energetic homeopathic potencies of : Caries, Gingivitis, Periodontitis 16x, 20x, 30x. Root Ostitis 20x, 30x. Argentum Metallicum, Mercurius Solubilis, Aurum Metallicum, Platinum Metallicum, Dental Materials (Amalgams, Composites, Bonding Resins, Dentin Bonders, Cavity Liners, Metals, Ceramics, Cements, Temporary Restoratives, Root Canal Materials, Anesthetics, Denture Materials, Flourides) 30x, 60x, 100x, 500x, 1000x. Recommended starting dose would be 3 drops under the tongue 1 time per day, for a week, increasing to 10 drops twice a day under the tongue thereafter. *As in all liquid remedies, do not touch the dropper to your mouth, or set the dropper down on a counter. Keep the bottle and dropper tightly sealed, as sterile as possible, and at least one foot away from cellphones, and other electronic devices and appliances. 3. NeuroAntitox Basic Formula® - Anytime toxins are being addressed the best way to avoid getting new symptoms is to neutralize the toxic effects of the substances right where they are, instead of dragging toxic substances through the tissues, causing damage all the way as they are moved through the body for elimination. I developed this formula to specifically enable people to dramatically reduce the symptoms that are often associated with heavy metal detoxification and eliminating microbial die-off toxins, which often also contain heavy metals. This product is one of the few products that research has shown will enable the body to eliminate toxins locked up in the brain. A good start would be to take 1 dropper in purified water 2-3 times a day and work your way up to 3 droppers, 3 times a day to support the body. 4. King Chlorella® - Not all chlorella products are created equal. Some varieties are extremely difficult for people to digest and therefore cause more problems than they fix. King Chlorella is the best form of broken-wall chlorella, and is therefore one of the easiest to digest and one of the most biologically active of the various chlorella products, at a reasonable price. Chlorella has a mucopolysaccaride membrane and chlorophyl (the green in plants similar to hemoglobin) that enables it to "sweeten the intestines," and pull many different types of toxins out of the body. I recommend chewing 1-3 a day and working your way up to as many as 10-12 a day. If the taste makes it too difficult to chew then simply swallow them whole. It it not necessary to push yourself and suffer by taking too many too soon. Listen to your body. If you are struggling, then back off until you feel you can add more to your daily regimen. Chlorella can be as effective as the prescription Cholestyramine at pulling toxins out of the body. 5. Probiotic Formula® by Transformation Enzymes, Inc. - Probiotics are friendly bacteria that colonize the health human intestines. These friendly flora bacteria help eliminate or kill the Candida, fungi, and harmful bacteria that will often grab onto and hold the heavy metals, preventing the metals from being eliminated from your body. There are many different probiotic supplements on the market, but they are not all the same, even if the types of friendly bacteria listed on the label are identical. How the bacteria are produced, whether they can withstand an acidic or alkaline environment or both, any the actual ratio and number of the various bacteria are important as well. General recommendation it to take 1 capsule morning and evening. 1. Drink a good whey protein powder supplement such as the great product, Goatein® by Garden of Life, Inc. Goatein is available in most health food stores. According to the world-renowned physician, Dr. Dietrich Klinghardt, MD, "Proteins provide the important precursors to the endogenous metal detox and shuttle agents, such as coeruloplasmin, metallothioneine, glutathione and others. The branched-chain amino acids in cow and goat whey have valuable independent detox effects. Metals attach themselves only in places that are programmed for attachment of metal ions. Just as important are electrolytes (sodium, potassium, calcium, magnesium), which help to transport toxic waste across the extracellular space towards the lymphatic and venous vessels." It is a unique protein powder made from goat's milk. An excellent source of complete protein (13g per serving) that contains all eight essential amino acids - protein building blocks crucial to good health. Goatein contains pure goat's milk from goats raised without antibiotics or growth hormones. Many commercial dairy protein powders are produced from animals given antibiotics and hormones. Many vegetable proteins are made from non-organic or genetically modified organisms and may contain chemical residues. Goatein® goats are not fed pesticides, herbicides, growth hormones, or antibiotics. 2. Drink 1/2 a gallon of distilled water per day and a 1/4 to 1/2 gallon of purified water per day, such as the Penta Water® brand of micro-clustered water from your local health food store. Even if a worker is exposed to heavy metals at their place of work, and are hospitalized as a result of the heavy metal toxicity, the hospital will have them drink distilled water to help pull the heavy metals out of circulation. Distilled water is demineralized, therefore it will pull other minerals and metals out of the tissues. For obvious reasons, such as pulling too many beneficial minerals out of the bones and tissues of the body, a person would not want to drink copious amounts of distilled water for more than four weeks. The product BCI that I recommend in this protocol has in its formulation all of the necessary minerals that would need to be replenished. 3. Skin Brushing - (skin brushes can be purchased from the Hansa Center store by calling 316-686-5900 ext 2) Click on the blue hyperlink to read how to do this properly and why dry skin brushing is important. 4. Strengthening/Nutritive Bath - Any form of detoxification is hard work for the body. For this reason many people feel fatigued while detoxing. It is important to take one day a week off from doing any supplements or detoxification therapies. On this day of allowing the body to rest, it is a good idea to do a Strengthening/Nutritive Bath. This bath allows the energetic and nutritive aspects of the bath ingredients to bypass the digestive tract, which would be taxed even more having to deal with the bath ingredients. If possible, do this bath after doing the Dry Skin Brushing protocol so that you knock off a lot of the dead skin and soap/oil residue that would otherwise block the absorption of the beneficial aspects of this bath. The Dry Skin Brushing will also stimulate the circulation of the lymphatic fluid and blood to pick up and distribute the healing, strengthening nutrients of the bath. This bath is a good "pick-me-up" for anytime you feel overloaded and stressed out. 5. Infrared Sauna - The skin is the largest organ of elimination of toxins. Your skin should be eliminating 2.5 pounds of waste acids and toxins per DAY! Talk about a healthy weight loss program! Most people have clogged up their skin with soap, shampoo, lotions, oils, and powders. 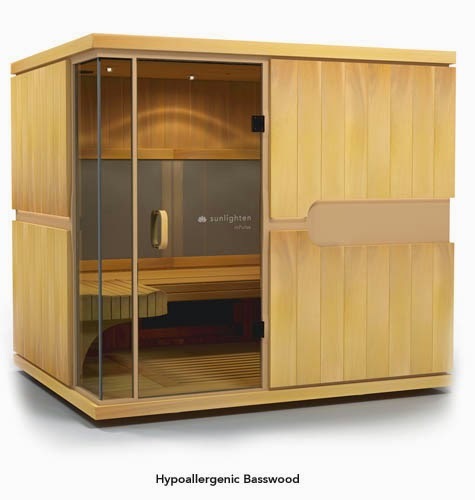 (The best and safest broad-specrum infrared sauna ) Avoid saunas that are made with plastics, glue, heavily scented wood types, such as cedar, hemlock, or pine, and those that generate high EMF pollution. If you cannot afford to purchase one of these saunas then please call your local gyms, health clubs, or natural doctors to see about getting access to using this important step in detoxifying your body. I have also heard several of our patients pooled their money with other people in their area to collectively buy one they could all use. *If you are pregnant, breastfeeding a child do not undergo any form of detoxification, since the heavy metals and toxins will end up in your baby! If you are excessively sick, weak, or emaciated, then do not start any form of detoxification before discussing it with your health care professional! The products recommended in this protocol are all well tolerated by reasonably healthy individuals, however it is a good idea to discuss this protocol with your natural health care doctor before starting no matter what your health condition, to strategize when you should implement this protocol if you are already taking supplements for another purpose. It may be that your doctor will want you to wait until the protocol you are already on is completed before beginning this protocol, since there is the possibility that the products of this protocol will interfere either with the products you are already taking, or will be too much for your body to handle both protocols at the same time. Although this protocol seeks to eliminate or minimize any worsening of health problems as a result of the detoxification process, due to the complexity of the human condition there remains the possibility of symptoms getting worse. Again, discuss this protocol with your health care professional before beginning, and stop or get support if your condition worsens. This protocol is not intended to treat, cure, diagnose, or mitigate any disease or illness, and has not been evaluated by the FDA. Just had my last amalgam filling replaced with a white one. - I took EDTA to remove the toxins and made myself anemic. I made sure to drink my Whey Isolate with Cilantro and Parsley (to remove heavy metals and toxins). Also took a good Prenatal vitamin and acidophilus to replace the good minerals and bacteria that I removed with EDTA. - Feeling a bit puny, but know I'll be okay soon. Dr Jernigan- this isn't really related to this post- but I wasn't sure how else to ask you this! Do you know of any way to get rid of long term tinnitus? I have had it over a year and have not found any way to even reduce it. Any suggestions? Thanks!